A report by the Iowa Policy Project says the amount of wind power generated in Iowa is up three-fold since 2006. I.P.P. research associate, Teresa Galluzzo, says they’ve been seeing signs that the amount of windpower was increasing. Galluzo says critics of windpower production as a way to reduce greenhouse gases have said the cost of electricity would go up, but she says that isn’t the case. She says they looked back at electric prices before wind power production got going and says they found that prices remained lower than the national average, and haven’t been increasing as rapidly in recent years. Osterberg says Alliant decided to “stick with a technology that everybody says they probably shouldn’t stick with.” Osterberg says the rate increase request includes some wind power, but a “bunch of coal.” The increase must be approved by the Iowa Utilities Board. Galluzzo says the 15% number is just for electricity produced by wind in Iowa. She says it’s tough to tell how much of the wind generated power is actually used by Iowans. Galluzzo says they don’t know how much of a utility’s fuel mix gets sold, or how much wind they buy. 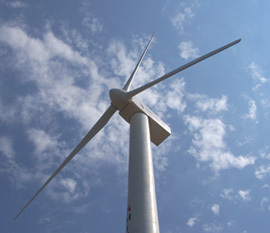 Galluzo says at the the end of 2008, the American Wind Energy Association (AWEA) found Iowa was second in the nation in installed wind-power capacity. Iowa had installed 2,791 megawatts of capacity by 2008, equal to 11% of the nation’s total wind capacity. You can see the Iowa Policy Project report here .